An early morning flight from Kathmandu takes you to the Lukla airport. The early morning flight to Lukla airport is refreshing and adventurous as well. On reaching Lukla, we walk to Phakding. This is the beginning of our trek. The interesting fact is that our high altitude trail starts by descending downhill via Chaurikharka and Chilung to Phakding. Overnight stay at available hotels/ lodges in Phakding. After a fine breakfast at Phakding, we will start up for Namche, a busy trading hub. The trial involves a steep climb up. We will walk through the amazing Dudh Koshi valley. Maintaining a pace, we hike up to Namche. From there, we will catch the first glance of Everest. Dinner and stay at a lodge or guesthouse in Namche. On this day, you will have an opportunity to explore more of Namche Bazaar. You can do some shopping as well. A comfortable stay at bakeries or internet cafes is convincing. You can walk into the Sherpa settlements as well. You can also hike up to the Everest View Hotel, a one hour walk (400 meters) from Namche. We will have a good breakfast at Namche Bazaar early in the morning. Then we will set out for Tengboche monastery by exploring the magnificent vistas around the trail. From the premise of the monastery, you will get the amazing panorama of the Himalayan peaks if the weather is clear. Plus, during expedition season you can meet the mountaineers preparing for their Everest expedition who have come to collect blessings in the monastery. Another morning and you start your trek to Dingboche. The views of mount Ama Dablam from the rocky trail are splendid. The trail is steep in the beginning. However, as you reach Dingboche, it is peaceful and heavenly. Overnight at local tea houses at Dingboche. 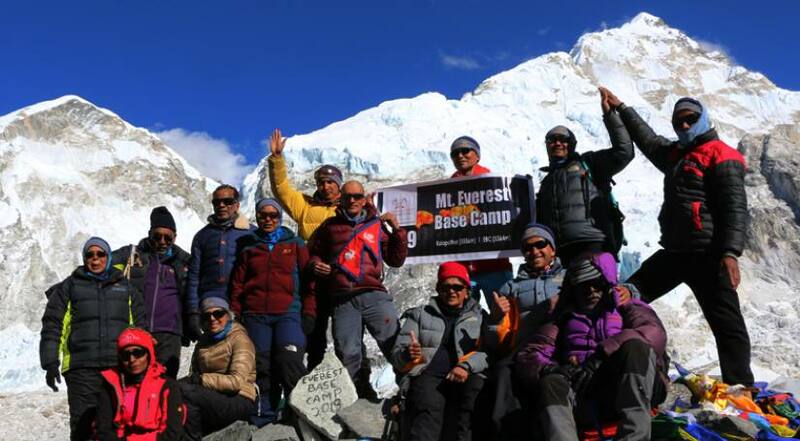 During the EBC trek, there are several changes in the altitude. So, this day is an acclimatization hiking day. Spend your day at Dingboche exploring the region. And hike to Nagarjuna hill. A fine breakfast at Dingboche and you will march towards Lobuche. You will come across the Khumbu glacier. The eye-catching view of Lobuche peak boosts you. A comfortable stay at a tea house. On this day, you will trek from Lobuche to Gorak Shep and to the Everest Base Camp and then back to Gorak Shep. Finally, you will see the EBC. After spending some time at the EBC, we will walk back to Gorakshep. After a tiresome hike of 8 hours, you will feel asleep as you find a cozy bed in a tea house. Kala Patthar is an optimum viewpoint of Mount Everest. Starting early in the morning, we will rush to Kala Patthar to catch the most beautiful view of Everest, Lhotse, Ama Dablam, Nuptse, and other peaks. It is the best and close-up location to catch the most spectacular view of Mt. Everest. We will walk down the trail to Labuje for a nightstand. A nice meal at the lodge and the day ends. Breakfast served early in the morning. Trek starts slowly downhill through the memorial place and you can stop in Thukla for tea and coffee. After that, you will continue down to Pheruche, Samare, Pangboche and finally reach in Tengboche. Overnight at a hotel in Tengboche. Enjoy the enchanting views of Himalayas along with the cup of tea at Tengboche. After breakfast, we will pack up and walk down to Namche for lunch. After having lunch and good rest in Namche you will trek continue about 2 and half hours to Manju. Overnight at a hotel in Manju. After a 5 hours walk from Namche, we finally stand at the point from where we initiated our trek. This is the final trip where you be walking to the airport. Last night on the lap of Himalayas! An early morning flight from Lukla and you are at the capital city of Nepal, Kathmandu. You may rest at the hotel till evening. We will host farewell dinner at a nearby Nepali restaurant. A sleep of relief at Kathmandu. Note: Sometimes due to bad weather you may have to face flight delay or cancellations. So, you must be prepared for such inconveniences.